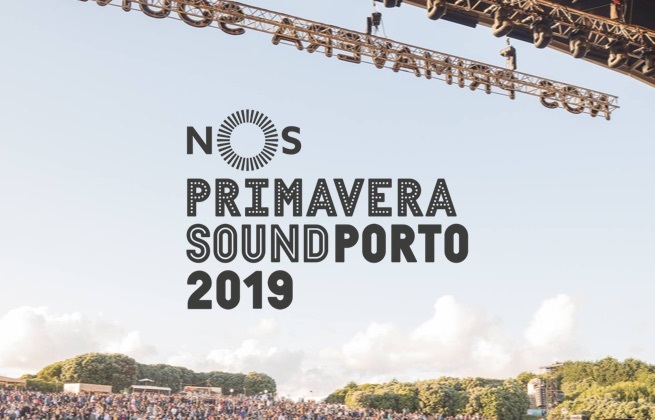 This ticket allows you to access NOS Primavera Sound 2019 on the 6th of June 2019. This ticket allows access to NOS Primavera Sound 2019 on the 7th of June. This ticket allows you to access NOS Primavera Sound 2019 on the 9th of June. 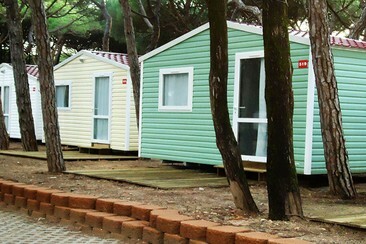 This package for 2 people includes 3 nights in Orbitur - Tent Pitch and 3-day shuttle pass to the venue from the campsite. 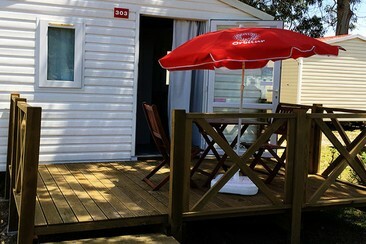 This package for 2 people includes 3 nights in Orbitur - Mobile Home Domino and 3-day shuttle pass to the venue from the campsite. This package for 2 people includes 3 nights in Orbitur - Mobile Home Pandora and 3-day shuttle pass to the venue from the campsite. This hostel is located in the historical Aliados area and is just a 3-minute walk from the São Bento Train Station. There is a 24hr desk, a shared living room and a hostel library. 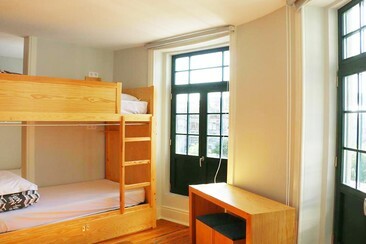 Linen is provided for all rooms and there is a daily breakfast. Guests can prepare their own meals in the shared equipped kitchen or enjoy a drink at the on-site cocktail bar. Alternatively, there are many restaurants and cafes within close proximity to the hostel. PILOT Hostel is located in the historical center with bar & lounge open around the clock, within 6 minutes’ walk from Aliados Metro Station. Praça de Carlos Alberto square is 3 minutes’ walk away and Avenida dos Aliados, home to the city hall, is 10 minutes’ walk. Porto’s Francisco de Sá Carneiro Airport is 18 km. 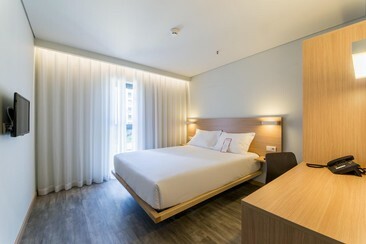 The rooms are clean and super comfortable, with not only the beds and individual lockers but also a sideboard and a few seats so that you can relax and socialize in the comfort of your privacy. Other facilities include free Wi-Fi and a cinema screen. The terrace has a barbecue, fireplace and waterfall. 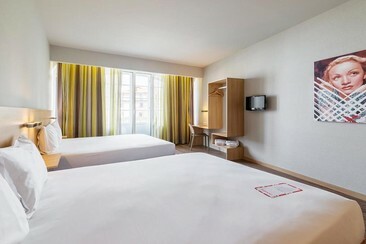 The Park Hotel Gaia is a modern hotel located between Porto and Gaia. Within a short distance from the Porto’s most important sightseeing, Park Hotel is located 900 meters south from the Arrábida Bridge, along the main highway for those traveling to Porto or Gaia. 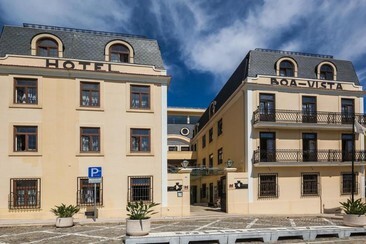 The hotel is 200 m from the Coimbrões Station and Golfe da Quinta do Fojo. The historical centre of Porto is 4 km away crossing the D. Luis I Bridge. Porto International Airport is a 15-minute drive from the property. Its free choice buffet breakfast is a quality option that is part of its brand image. 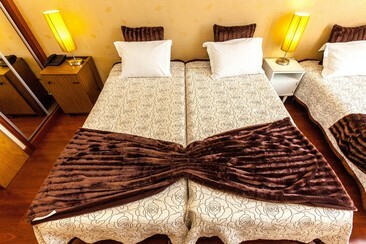 Park Hotel Gaia rooms are decorated in neutral colors and have modern wood furnishings. They offer air-conditioned, free Wi-Fi and a private bathroom with shower and a seating area with a large flat-screen satellite TV. You can park your car in its free outdoor park or in its low price indoor car park on your arrival, avoiding thus any traffic or rush hour from the two major cities. Featuring a relaxed and informal mood, the Moov Hotel Porto Norte offers comfortable and affordable accommodation in the city of Porto. Spread throughout 7 floors, the practical rooms at Hotel Moov Porto Norte are equipped with basic furniture, soundproofing, climate control, flat-screen satellite and cable TV, wardrobe, desk and telephone. The private bathrooms include ecological showers. 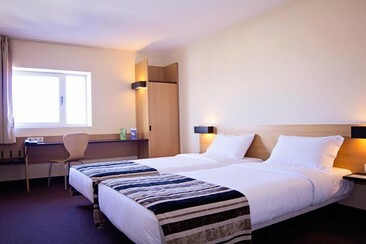 All rooms are non-smoking and cannot accommodate cots or extra beds. Every morning a varied breakfast buffet is served which is not included in the rate. Within walking distance guests will find a variety of restaurants as well as the Norteshopping shopping centre with its various stores and eateries. The Sete Bicas Metro Station is a 5-minute walk, connecting guests to the centre of Porto. Porto Norte Moov Hotel features a 24-hour reception, private parking and daily cleaning. 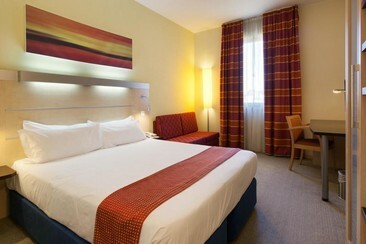 It is 10 km from Porto International Airport, 5 km from Exponor and just 183 meters from Porto Business School. The Park Hotel Valongo is located in the heart of Valongo, just 15 minutes away from Oporto International Airport, Exponor, Freixo Bridge, Arrábida Bridge, and 20 minutes away from Oporto and Gaia centers, Oporto Wine cells, Gaia and Oporto docks, El Corte Inglês, Arrábida Shopping, Casa da Música and Fundação Serralves. More conveniently, regular buses to the center of Porto depart near the hotel. The hotel bedroom distinguishes itself for its personal-temperature control air conditioning, easy access to the Internet, traditional en-suite bathrooms, television with 20 channels, writing desk, phone, soundproofing through two double-glazed windows, dividing walls in massive concrete, doors with high acoustic protection, orthopaedic mattresses and high quality pillows plus locks with high security codes. The breakfast buffet is served every day from 6:30 am to 12:00 pm with a variety of food including fresh squeezed orange juice and all sorts of bread. Around our 24/24h front desk, you can also find all of your favorite light snacks and drinks available from the vending machines whenever you feel like it. Besides, Park Hotel Valongo is very pleased to offer you free indoor and outdoor parking as well as a bar which serves refreshing drinks. 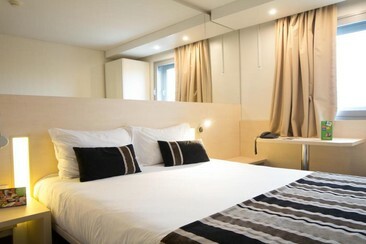 Situated in a refurbished Art Deco cinema, Moov Hotel Porto Centro offers modern rooms with free WiFi. Porto train and metro stations have connections to Porto Airport, and are within a 3-minute walk from the hotel. The modern, acclimatized rooms at Moov Hotel Porto Centro are decorated in soft colours and feature black and white photographs. 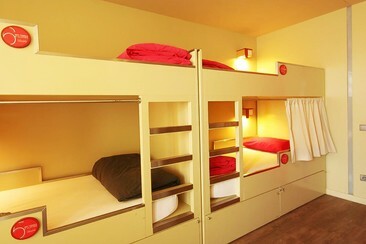 Each has a desk and a private bathroom. There is an inner courtyard terrace with tables and chairs for relaxing with a coffee. Holiday Inn Express is situated in front of the Porto International Fair - Exponor, with easy access to all major city ring roads. The property has 134 air-conditioned rooms that feature internet access, tea and coffee making facilities, and an en suite bathroom. Guests can enjoy a continental breakfast each morning and a pick-up and drop-off laundry & dry cleaning service is available. The 24-hour front desk can arrange car rental services. Since opening, the Holiday Inn Express Porto Exponor has been the solution for people traveling on business and leisure due to its location-practically opposite the Exponor Congress and Fair Exhibition Centre and very close to Porto Airport, Marshopping (IKEA) and Norteshopping, the sea Port, the Equestrian Center Matosinhos, Leca da Palmeira beaches and the historical centre of Porto! Hotel Boa Vista overlooks the mouth of the Douro River and the Atlantic Ocean and boasts a rooftop pool which is accessible all year and has a panoramic outdoor café. The property has 71 guest rooms with air-conditioning, a minibar and free Wi-Fi and some offer sea views. Guests can enjoy Portuguese cuisine served at the hotel restaurant or enjoy a drink on the hotel's terrace. The Panoramic Restaurant on the 4th floor offers unique views of the city of Porto while soaking up the sun in the pool area. The fitness centre is also available for guests to use. The hotel is a 5-minute walk from Ingleses Beach. 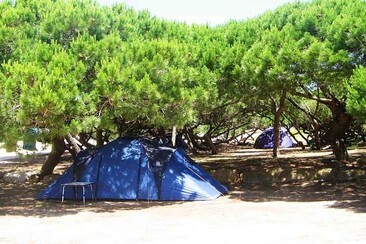 It is 1.5 miles from Oporto Sea Life and a 15-minute drive from the Arrabida shopping area. The 3-star Hotel Quality Inn Porto enjoys excellent setting overlooking the Douro River, it is a 5-minute walk from São Bento Metro Station and features a bar with room service. 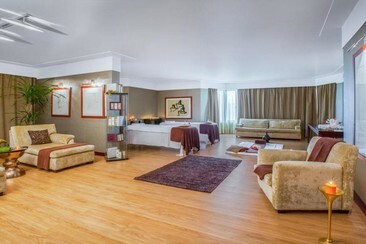 The soundproofed rooms at Hotel Quality Inn Porto are equipped with air conditioning, a satellite TV, tea and coffee-making facilities and include a seating area with couch. En-suite bathrooms come with hairdryers. Guests can relax in the contemporary lounge. The hotel offers a tour desk, a lift and currency exchange for general needs and computers. In the central Boavista district, our Crowne Plaza Porto hotel is a short walk from Porto Botanical Garden and concerts at the futuristic Casa da Música. Bom Sucesso market are 15 minutes' walk from the hotel while the historic district of Ribeira is 15 minutes' drive away. Closer still is the Serralves cultural centre, with a modern art museum, an art deco villa and a park and only a few kilometres from Porto’s beautiful beaches. Alfândega Congress Centre is less than 15 minutes' drive from the hotel. The contemporary rooms feature air-conditioning, free Wi-Fi and tea and coffeemakers, plus flat-screen TVs and marble-clad bathrooms. Comfortable, private and convenient transfer A private airport transfer for up to three people from Porto City Centre to Porto Airport. Surfboard + Wetsuit Rental for 2 h or half day. Experience surf lessons in one of the best Portugal beaches! Become an expert of Portuguese wines! Experience the best Portuguese food!